Explanation: If you could turn off the atmosphere's ability to scatter overwhelming sunlight, today's daytime sky might look something like this ... with the Sun surrounded by the stars of the constellations Taurus and Gemini. Of course, today is the Solstice. Traveling along the ecliptic plane, the Sun is at its northernmost position in planet Earth's sky, marking the astronomical beginning of summer in the north. Accurate for the exact time of today's Solstice, this composite image also shows the Sun at the proper scale (about the angular size of the Full Moon). 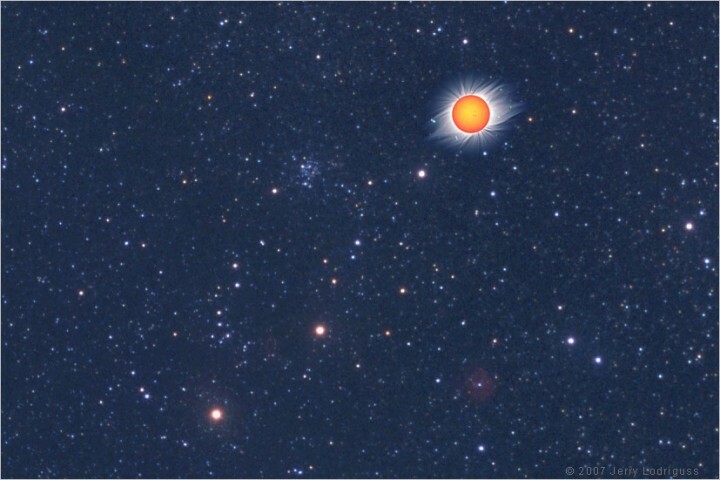 Open star cluster M35 is to the Sun's left, and the other two bright stars in view are Mu and Eta Geminorum. Digitally superimposed on a nighttime image of the stars, the Sun itself is a composite of a picture taken through a solar filter and a series of images of the solar corona recorded during the solar eclipse of February 26, 1998 by Andreas Gada.